AirVision-C is end of life (EOL). Ubiquiti recommends UVC-NVR for functional replacement. The airVision NVR is a plug-and-play NVR appliance with low power consumption. The airVision software is pre-installed for quick and easy installation. No additional software is required. Plug it into the network, go through the configuration wizard, and it is set up and ready to go. 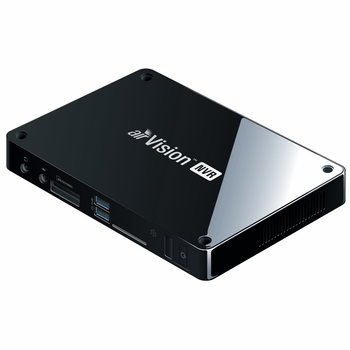 The airVision NVR has a built-in 500 GB hard drive. This equates to approximately 1200 recording hours @ 480p resolution or 400 recording hours at 720p resolution (these can vary depending on the frame rate). For additional storage, connect USB 3.0 hard drives or network storage devices. airVision gives you a variety of options and settings to customize what your cameras record. Quickly assess important camera activity and NVR performance with easy-to-read graphs. Customize your own motion detection zones. You can place several zones and set their alarm sensitivities as high or low as the situation demands.